A useful feature of GPS-based systems is that the inside and outside boundaries of the track can be added to the map. 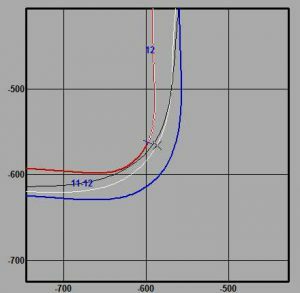 This allows the user to quickly see if the rider’s line choice is responsible for an abnormal speed or other channel trace, and use the data accordingly. In addition, the resolution of most systems is accurate enough that the rider’s line around the track can be depicted and compared to another rider’s. 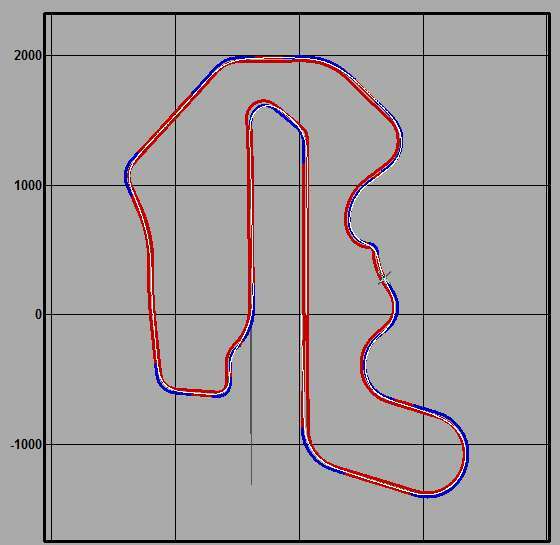 The inside and outside edges of the circuit are mapped by riding or driving around the track, following the respective edges and recording the data. The mapping software can then generate the map from a normal lap, a lap of the inside of the course, and a lap of the outside. 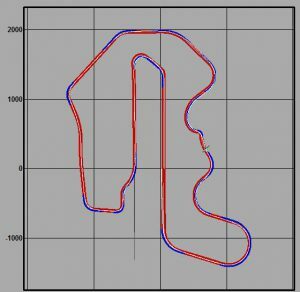 This GPS-generated map of Thunderhill Raceway Park shows the outside and inside boundaries of the track. The white trace is the rider’s line around the track. The trace actually represents the antenna’s path, which may step over the inside edge of the track in corners, as seen here in some cases. A lap-zoom option allows a closer look at the line in any particular corner. Here, two riders’ lines are shown, one in black and one white. You can clearly see a different approach to the corner by the two riders. Before going to the trouble of creating your own inside/outside maps, check on-line or with the system’s manufacturer if someone has already done the work and the maps are available. Physically recording the data is not difficult, but what can be tricky is finding time when the track is open and empty for you to make the necessary laps. When gathering the data for the inside and outside edges, it is easiest (and safest) to use a car rather than the motorcycle, and to do it when no one else is on the track as you’ll be cruising around slowly. Set the GPS antenna on the roof of the vehicle (on the appropriate side) and complete at least one complete lap around the track for each edge. That will usually require an out lap, the complete lap and an in lap, for a total of six laps. Don’t forget that most data systems record only above a set speed, and you must either change the required speed through the software or drive above the necessary speed to record the data. The good thing about all this work is that you only have to do it once to create the map.